This is a very nice clean, 18" long STILLSON pipe wrench marked "STILLSON WRENCH MFG. BY HENRY & ALLEN AUBURN N.Y. U.S.A. GUANTEED 18" in cast lettering. This one has been used, but overall is in very good working order, not bent, cracked or otherwise damaged, a small hammer dings on the handle area, jaw area is very good, very good jaw teeth, two good springs, good knurl and gear teeth, adjusts just fine, no rust, no pitting, good pivot joint, with no original intact, no rust, no pitting, useable condition. This is a good antique wrench made about 100 years ago. 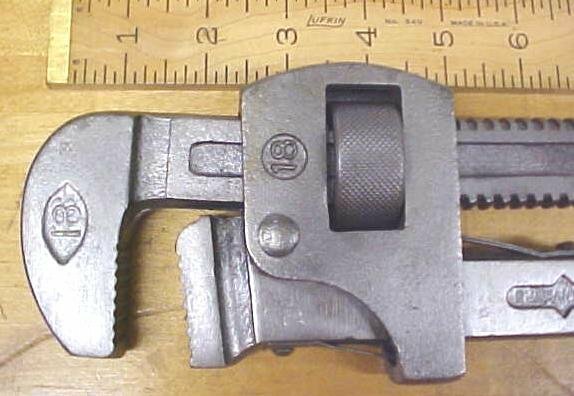 Items Similar To "Stillson Adjustable Pipe Wrench 18" Henry & Allen"